Widespread and abundant in most parts of Central and Northern Europe, including Great Britain and Ireland. On the southern peninsulas (Iberia, Italy, Balkans) rare and restricted to mountains. Dark brown temporal spot behind the eyes. Back yellow-olive to dark brown, with dark to black spots, usually contrasting. Wide variety in colour: even light yellow spots on a brown background. Ventral side usually – often reddish – marbled. The nuptial pads on the thumbs of males are black to dark brown. Common frogs spawn explosively: within 2-3 days many animals spawn, often hundreds of them together, during constant, soft growling of the males. The egg clumps usually float at the water surface. This frog is the most common one we have. 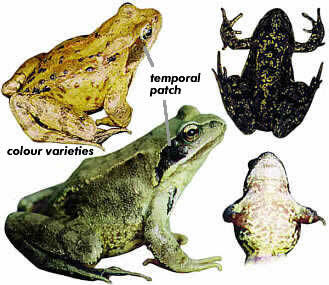 Except for the breeding season Common frogs have a hidden life on land. Short hind legs (compare with Agile frog)!